Learning to calm the mind can be an enlightening revelation...to say the least. The best part about this phenomenon is that it is completely unique to each individual. It also can affect any number of senses, so the combination of feelings, perceptions, and outcomes are endless. Being patient allows the concept of learning to take on a new meaning. It allows oneself to invigorate the senses, thus increasing depth perception, not to mention it takes a hell of a lot of pressure off the enlightened. As a musician, being patient with oneself, allows us to feel what is in between the notes as well as letting us control the detail of said note…. and when that happens…. magic ….spontaneity ….flexibility ...well, you get the point. In layman’s terms, using patience in any endeavor is the art of never going beyond one’s ability level to soon, and while doing this, using complete concentration 100% of the time. As with any profound task, where to start is always an issue. 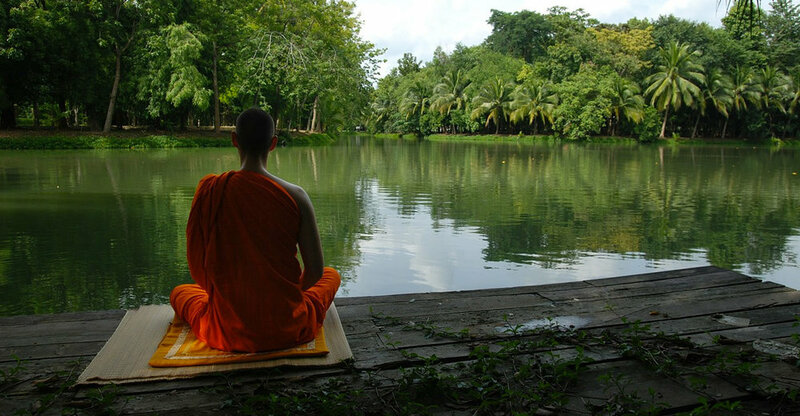 Well, young grasshopper, never fear, simplicity is the key to success…...clearing the mind. A pivotal moment in my pursuit of enlightenment happened to me when I was at a music festival. At my hotel, I noticed a buddhist monk who was also staying there. I was intrigued by this fellow and I knew very little about their method of meditation, but, I figured it was very deep and way beyond my limited comprehension into self reflection. But, I thought, what the hell, so I approached him, and asked if he could show me how it’s done. He was completely amenable and agreed to meet. We convened in a quiet spot and he explained that we were to sit a certain way, with our hands in a certain position, and proceeded to breath in and out. He then told me to think one thought. I thought, “This is it! I’m about to be let in to the secret world of zen!!!! !” and he said, “Think of the number 1 when you breath in and then the number 2 when you breath out……..then……….the number three when you breath in and the number four when you breath out….and so on and so on. He also said, “if any other thought other than the number comes into your head...just start over.” I have to say….I was bit disappointed. Oh well, I guess with anything...you have to start somewhere. Maybe self reflection can get very deep but that’s as far as I got with it, and the beauty of it is….it works! Thinking of only a number and seeing that number in its entirety and nothing else allowed me to improve concentration by a huge amount, which in turn allowed me to be more productive in pretty much every endeavour that I tried. Taking this to the practice room will help you to focus and stay in the moment, which, in turn will give you greater results in whatever you are trying to improve. It will also give you a greater perspective into how much to do and how to get from point A to B. Try to be true to yourself and set small goals with each practice session. Do this, young grasshopper, and you will reach the promised land….or, at least your paradiddles will get better. Enjoy! !